Alaska Gov. Sarah Palin announces she's stepping down this month. "People who know me know that besides faith and family, nothing's more important to me than our beloved Alaska," Palin said in an announcement from her home in Wasilla. "Serving her people is the greatest honor I could imagine." Palin was elected governor in 2006. She was chosen as Arizona Sen. John McCain's vice presidential running mate last year. Palin used a sports analogy to explain her decision: "I know when to pass the ball." A Republican source close to her political team told CNN's John King that it was a "calculation" she made that "it was time to move on." The governor's "book deal and other issues" were "causing a lot of friction" in her home state, the source said, adding that he believes that she is "mapping out a path to 2012." iReport.com: What's your take on Palin's decision? Randy Ruedrich, chairman of Alaska's Republican Party, said he "was not even contemplating her stepping down." Ruedrich said he recently met with members of Palin's staff to discuss her re-election plans. He said he told them that it would be good if she made her decision by October for fund-raising purposes, rather than wait until June 2010, the legal deadline to commit to an election run. He said he anticipated that she would run for the seat again and was surprised today to learn otherwise. Ruedrich, who had a rocky relationship with Palin that often played out in the local media during her tenure in Alaska politics, said he last spoke with the governor about a month ago. The discussion was solely on how to help raise funds for the election of Anchorage, Alaska, Mayor Dan Sullivan, he said. After Palin's announcement, the Democratic National Committee blasted her "bizarre behavior." "Either Sarah Palin is leaving the people of Alaska high and dry to pursue her long-shot national political ambitions, or she simply can't handle the job now that her popularity has dimmed and oil revenues are down," DNC spokesman Brad Woodhouse said. Alaska's senior senator, Lisa Murkowski, was not happy with Palin's decision. 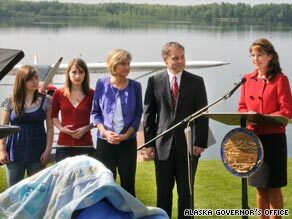 Murkowski is the daughter of former Gov. Frank Murkowski, whom Palin defeated in the 2006 gubernatorial primary. Republican strategist and CNN contributor Ed Rollins said that, to a certain extent, Palin's announcement makes her look "terribly inept." "I think people are going to be very suspicious because of the timing. You don't quit on the Friday of a three-day holiday. If you are going to do this, you think it through; you give a good speech," Rollins said. However, CNN Republican strategist Mary Matalin said she thought the move was "really brilliant" on Palin's part, though she admitted she was surprised when she heard the news. "Her delivery was incredible. If you're a less charismatic person, you probably couldn't pull it off," Matalin said. "[Now] she will be freed up and liberated the way Mitt Romney is to raise money and get political chips by spending it and getting political capital. And she is still raising the kinds of crowds and money she always did." When asked whether it's possible Palin stepped down because of negative news that has not emerged, Matalin referenced Palin's own words that investigators have dug through research in the ethics investigation. "We presume if there was anything else, we would know it by now," Matalin said. Palin catapulted on the national stage in August when McCain, the Republican presidential nominee, chose her as his running mate. CNN's Peter Hamby, John King, Mark Preston, Kristi Keck and Alan Silverleib contributed to this report.